Seems the only business stories these days on the radio is the sharp decline of the global stock markets. After Wednesday's incredible gain on the Dow, Thursday saw much of those gains wiped out. After setting a record high back on September 3rd, the TSX has lost 7%. The news agencies don't want to call it a market correction until it hits 10%. I'm not sure who comes up with these definitions. It looks like a correction to me. Seems most of this is believed to be caused by the falling oil prices, economic uncertainty in Europe, and the pending war in Iraq. 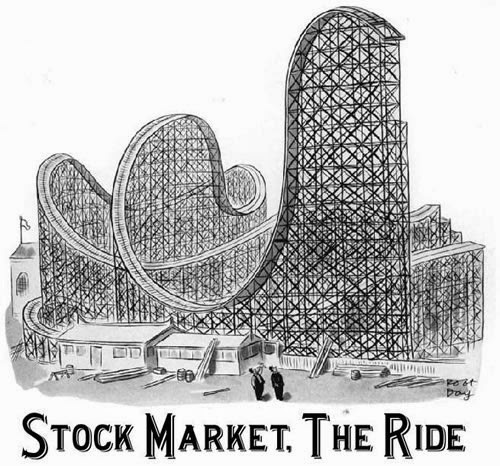 You know economists, they are trying to find a reason to explain the roller coaster ride that is the stock market. I haven't looked at my and wifey's portfolio, but I'm sure we're probably in the minus for the year. Fortunately, I don't really care. Would it be nice if the stock market kept rising? Sure. Why not? However, even if the TSX was up 20% for the year, you wouldn't see me selling any of our holdings. If the TSX ends up in the minuses by the end of the year, you still wouldn't see me selling any of our holdings. Up or down, it doesn't matter right now. We're in it for the long term. It's not the price of the holdings that matter, but the number of holdings you have. If you bought 100 units of ABC at $10 and it goes up 50% in two months, you'd still have 100 units. After this, if ABC drops to $7.50 per unit in the next 2 months, you'd still have 100 units! Price only matters if you actively trade in the stock market. Since we're saving for retirement and not looking to get rich quick, we're not actively trading. Of course, since we're contributing to our portfolios periodically, the sight of a bull market should make you cringe. Yes, it looks great on paper, but a bull market means you'll be paying more for your investments. What makes me happy is a bear market, when prices are down, wifey and I can buy our investments at a lower cost. Whoot! This doesn't mean you should wait to buy your funds or ETFs when the market is down. What happens if the markets go up for 2 years? You'll be missing out on all those dividends and distributions. Just buy everything on a schedule. Wifey and I purchase our ETFs with each pay cheque. We calculate the money we need to set aside for expenses that are coming up and throw the rest into our investment accounts. In addition, wifey contributes 5% of her pay cheque to her group RRSP with a company match of 5%. This kind of schedule doesn't look at how the markets are doing. It just buys, buys, buys. In the meantime, I hope everyone has a wonderful Thanksgiving on Monday!